If you are looking for Indian movie poster art contact us on mobile no. +919022034923 / +917666866256 or MAIL US ON: bollywoodpostersstudio@gmail.com Bollywood posters studio online store offers you hand painted Indian movie poster art reproductions of old and new Bollywood posters for sale !!! These beautiful hand painted Indian movie poster art collection can be used as wall hangings and home decor. The perfect way to make your bedroom, office, studios, restaurant, motels, DVD stores, dance studios, funky boutiques, salon etc unique, authentic and elegant..
Bollywood posters studio USP – committed to their work even bulk orders of hand painting movie posters art and completed them on urgency of the clients for marriages, events, special ceremonies etc. Wherever you are living you can order your hand painted Indian movie poster. If you are looking for hand painted Indian movie poster of famous superstar and legendary actors and actress like Waheeda Rehman, Meena Kumari, Rajesh Khanna, Amitabh Bachchan etc your search ended at Bollywood posters studio. 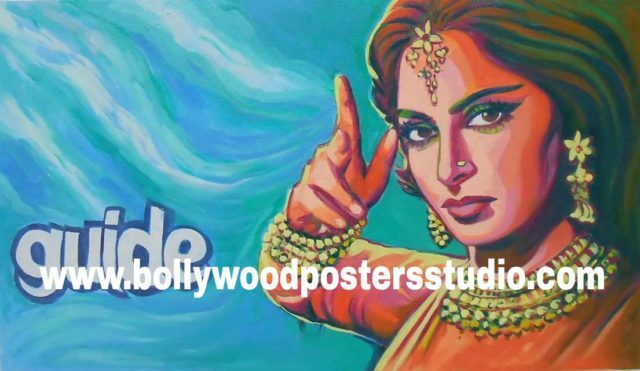 Hand painted Indian movie poster of Waheeda Rehman of Guide movie for sale !! !